Fiserv, Inc. (NASDAQ:FISV) was in 29 hedge funds’ portfolios at the end of December. FISV investors should pay attention to a decrease in hedge fund sentiment in recent months. There were 31 hedge funds in our database with FISV holdings at the end of the previous quarter. Our calculations also showed that FISV isn’t among the 30 most popular stocks among hedge funds. To the average investor there are tons of formulas investors put to use to appraise publicly traded companies. A couple of the best formulas are hedge fund and insider trading moves. Our experts have shown that, historically, those who follow the top picks of the best fund managers can outperform the market by a solid amount (see the details here). Let’s take a look at the recent hedge fund action regarding Fiserv, Inc. (NASDAQ:FISV). How are hedge funds trading Fiserv, Inc. (NASDAQ:FISV)? Heading into the first quarter of 2019, a total of 29 of the hedge funds tracked by Insider Monkey were long this stock, a change of -6% from the previous quarter. 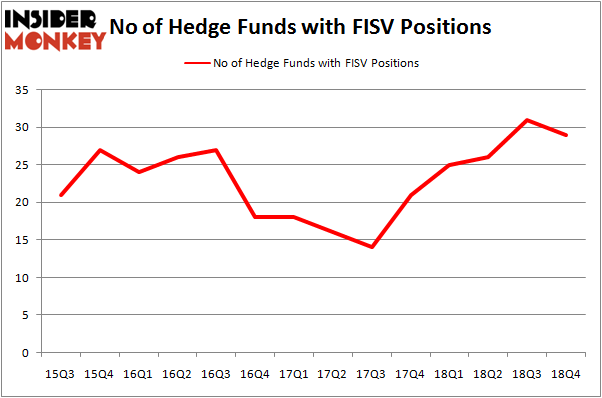 The graph below displays the number of hedge funds with bullish position in FISV over the last 14 quarters. With hedge funds’ sentiment swirling, there exists a few notable hedge fund managers who were adding to their holdings meaningfully (or already accumulated large positions). The largest stake in Fiserv, Inc. (NASDAQ:FISV) was held by Kensico Capital, which reported holding $114.5 million worth of stock at the end of September. It was followed by Adage Capital Management with a $56.7 million position. Other investors bullish on the company included AQR Capital Management, Nitorum Capital, and Two Sigma Advisors. 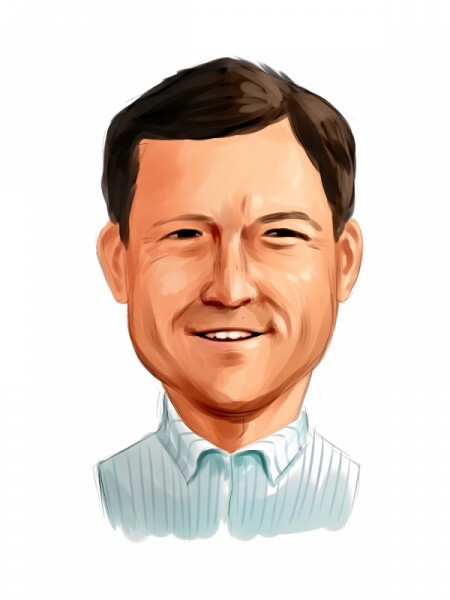 Because Fiserv, Inc. (NASDAQ:FISV) has witnessed falling interest from hedge fund managers, it’s safe to say that there lies a certain “tier” of hedgies that elected to cut their full holdings by the end of the third quarter. Interestingly, Doug Silverman and Alexander Klabin’s Senator Investment Group said goodbye to the biggest position of all the hedgies monitored by Insider Monkey, totaling about $148.3 million in stock. Peter Rathjens, Bruce Clarke and John Campbell’s fund, Arrowstreet Capital, also dropped its stock, about $25.4 million worth. These moves are important to note, as aggregate hedge fund interest was cut by 2 funds by the end of the third quarter. Let’s check out hedge fund activity in other stocks similar to Fiserv, Inc. (NASDAQ:FISV). These stocks are Canadian Natural Resources Limited (NYSE:CNQ), Telefonaktiebolaget LM Ericsson (publ) (NASDAQ:ERIC), Nutrien Ltd. (NYSE:NTR), and Yum! Brands, Inc. (NYSE:YUM). This group of stocks’ market caps match FISV’s market cap. As you can see these stocks had an average of 28.75 hedge funds with bullish positions and the average amount invested in these stocks was $765 million. That figure was $306 million in FISV’s case. Yum! Brands, Inc. (NYSE:YUM) is the most popular stock in this table. On the other hand Canadian Natural Resources Limited (NYSE:CNQ) is the least popular one with only 24 bullish hedge fund positions. Fiserv, Inc. (NASDAQ:FISV) is not the most popular stock in this group but hedge fund interest is still above average and near its all time high. Our calculations showed that top 15 most popular stocks among hedge funds returned 19.7% through March 15th and outperformed the S&P 500 ETF (SPY) by 6.6 percentage points. Hedge funds were also right about betting on FISV, though not to the same extent, as the stock returned 17.3% and outperformed the market as well.